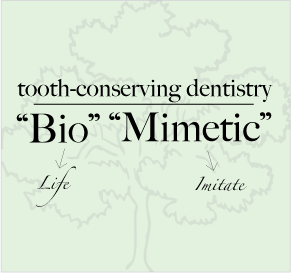 There’s a new method to dentistry spreading through the nation and it’s all about conservation. Most dentists are taught in school the traditional, and some say outdated, “drill and fill” techniques that have been the core of dental education for centuries. However, some dentists have had enough of damaging and destroying healthy parts of the teeth and are looking to change the way things are done. These dentists who follow what is called the biomimetic approach to oral care believe in less-invasive techniques that mimic nature and promote the concept that “less is more” when it comes to drilling. The techniques, procedures, and materials used in biomimetic dentistry seek to copy the way your teeth naturally work to protect themselves against bacteria and possible infection, prevent tooth loss and improve bonding. That’s why it’s called “Biomimetic.” It literally means to imitate life. Research is showing a great success for this revolutionary, yet simple, way of approaching dental treatments. Patients report high levels of satisfaction with these techniques for several reasons. One of the most popular things about biomimetic is that it requires far less use of the dental drill, with the goal being not to use it at all if possible. Traditional dentistry encourages drilling well beyond the infection or decay in almost all situations. This leads to a weaker tooth structure that cracks and fractures much easier. By avoiding the drill whenever possible, teeth stay healthier and stronger. This also leads to less sensitivity and pain. Many find they have fewer cavities and require less visits to the dentist as a result. Financially, patients are finding that their long terms costs have decreased exponentially thanks to longer lasting results and easily repairable procedures. Most dental work has limitations and isn’t capable of lasting forever. Fillings usually need to be frequently redone which requires many trips to the dentist to perform the same procedure on the same tooth, time and time again. Each time the filling is replaced the tooth becomes weaker and more likely to need more work the next time. In the case of traditionally treated teeth, once the treatment has become ineffective due to time and wear, many times the entire tooth is compromised and has to be completely removed. In biomimetic restoration, the tooth was strengthened and left in optimal condition after the original treatment and can easily be repaired. It seems logical that reducing the number of times a procedure must be performed saves money and comfort. Consider the cost of replacing one filling several times throughout the average life span. Then multiply that times the number of teeth the average person has filled. The costs quickly add up and can be staggering. Using materials that mimic the elasticity of the enamel and dentin that make up your teeth not only looks more natural but provides a stronger structure for chewing and other everyday wear and tear. Stronger more natural teeth also have a lower likelihood of getting cracks, fractures or decay. Scientists around the world seem to be discovering in all their research that our incredible bodies know what they’re doing and following their lead is the key to maintaining optimal health. Hopefully, more dentists will soon discover the amazing benefits that biomimetic dentistry offers both patients and dental professionals.